Stop by the Wimbledon Tournament While Exploring London! The Wimbledon Tennis Tournament is a great way to experience British Culture and prestige. The cobblestone streets of London during the Wimbledon Tournament are a great starting point for your next Euro trip! 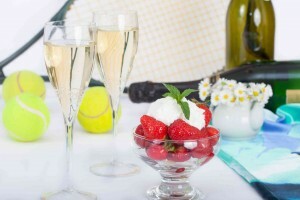 Entwine yourself in another culture as players lunge for the ball in their crisp, white uniforms and spectators enjoy the strawberries and cream desserts associated with the event. Held at the All England Club, a private member’s’ organization, in late June or early July, the winner takes home a prize of 3 million pounds and a gold trophy inscribed with their well-earned title, “The All England Tennis Club Single Handed Champion Of The World.” The tournament attracts a global viewership of more than 1 billion in 200 different territories. Next summer, experience the pageantry of London and be sure to make Wimbledon part of your itinerary. So what exactly is this prestigious All England Club? Referring to it by full name, we’d say, “The All England Lawn Tennis and Croquet Club.” It is a member’s only club with it’s own courts that operate year round. Queen Elizabeth II still offers her patronage, and the president remains The Duke of Kent. With 375 full members, the club continues to strive as the venue for the Wimbledon Tournament. Becoming a member is difficult. Many letters of support from existing members must be provided, two of whom must have known the applicant for more than three years. So you may not be able to join club, but could get a glimpse of The Royal Family! The history of Wimbledon Tennis Tournament is rooted in lawn tennis, an offshoot of the original indoor racquet sport. Unlike the Australian Open, the US Open and the French Open, which are played on clay courts, Wimbledon is the only tennis championship still held on traditional, mown grass. The prestigious event’s traditional grass surface is known for increasing the speed of the game and results in exhilarating play. Many traditionalists still refer to the sport’s indoor equivalent as ‘real tennis’ but outdoor tennis has become the face of the sport. And the Royals agree! They’ve been loyally attending the event since 1907. Some of them have even publicly played on the field! Come to London and see one of the biggest British tennis tournaments, and explore the traditional side of England, and watch the household names of Nadal, Federer, Williams and Sharapova make history! AESU offers several trips to England, including: Cosmopolitan, Euro Spree, Explorer, Euro Focus, and our most popular tour, Great Escape. Explore England and its rich history and culture. This entry was posted on Thursday, July 7th, 2016	at 11:07 am	. You can follow any responses to this entry through the RSS 2.0	feed. Both comments and pings are currently closed.